Also included is a duckbill door sensor and led flashlight. Just hang the alarm on the knob and insert the duckbill attachment into the space beteen the door and the jamb. When the door opens or is shaken enough to cause the duckbill to fall out, the alarm will sound. With an unbreakable plastic shell and small size -measures 2 7/8 inches x 2 and one-eighths inches x 1 and one-eighths inches-this alarm is perfect for keeping yourself and your property safe. 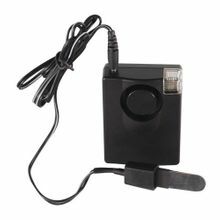 This alarm requires one 9 volt battery that is available separately.